With several large-scale projects underway the face of Mangawhai is changing rapidly with a prediction from a community leader that the eastern town’s population could rival that of Dargaville. Central to this expansion is the highly anticipated Mangawhai Central development. 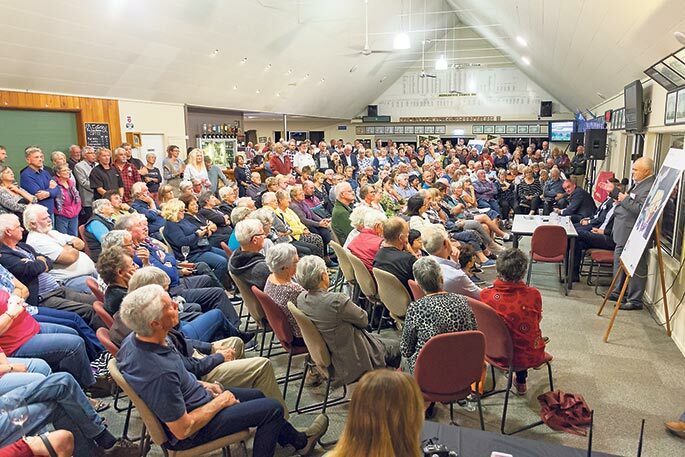 The sale of the 128 hectare Molesworth Drive property to Auckland-based company Viranda Holdings Ltd was settled in March this year, and the developers met with the community at the Mangawhai Museum last Friday to discuss the project’s progress. Viranda Holdings Ltd managing director and property manager, Mark Bridgman, said the meeting attracted a large and diverse crowd and announcements were made regarding supporting a number of local initiatives, such as the Mangawhai Activity Zone, Mangawhai Heads Surf Life Saving Club and the Mangawhai Museum. Kaipara Mayor Jason Smith, deputy mayor Peter Wethey and councillor Jonathan Larsen also attended. “The developers are very open to hearing from the community. People had concerns, about where the water would come from and go to from such a large development, and seemed to be satisfied with the answers they were given about that at this stage,” said Mayor Smith. Other projects are coming to the fore, including the community-driven Mangawhai Activity Zone with the recent completion of an adult outdoor fitness gym and three bike circuit tracks planned. The committee needs a further $500,000 to complete the skate park and bring it up to Olympic standards for training ahead of the 2020 Tokyo Olympics. “Seeing everyone enjoying the park these school holidays makes all the hours we put in worthwhile. Our committee is quite small, with eight members, and it’s 100 per cent voluntary,” said Mr Gallagher. The trust is working closely with the Mangawhai Recreational Charitable Trust, and work has begun on the Mangawhai Estuary to Vineyard Walking/Cycling track, which will link the Mangawhai Golf Club, the information centre and the Mangawhai Activity Zone bike track to the Pioneer Village and Mangawhai Museum. MRCT trustee, Gordon Hosking, says the aim is to get cyclists off the road. The Pioneer Village Trust committee is working on completing the courtyard area in front of the historic buildings, and plans to hold events such as a night market on the site as funding allows.